Children need to like what they're reading to progress so give them choice in what they read. When we think of reading for our children, we are often misled into thinking that we need to focus on one type of book, such as picture books or novels in order to practise specific, reading-related skills. However, this narrowly-focused approach to reading instruction can often have undesirable benefits, such as turning kids off reading altogether. As parents, we often feel that when we select children’s books for them we are supporting them to achieve at their level – though this frequently has the opposite effect. When we restrict choice, particularly to contrived, boring texts, children frequently see this as an indicator of their reading capability and therefore meet that low expectation. Once we take the restrictions away from what children read, their self-efficacy towards reading increases, therefore leading to an increase in their reading ability. As adults, we read what we like and enjoy. We don’t feel pressured to finish a book if it doesn’t interest us, as my bookshelf with half read books will attest! It is vital that we strive to provide the same environment for our children, where there are no penalties for unread or unfinished books. Comprehension: constructing meaning from the text, while connecting this information to what the reader already knows. Donalyn Miller, a former school teacher from Texas, highlights the importance of talking about realistic reading in the classroom, with ideas that are easily transferred to the home. In The Book Whisperer, Miller echoes what hundreds of effective reading teachers do everyday: share the joy and experiences of their own reading life. Once the weight of unrealistic expectations is lifted from the student’s shoulder, they feel free to explore different texts and read what interests them. Students can read whatever they want to read (within reason) and there is little or no accountability in the form of book reports or grades. In my reviews of the research on in-school free reading, I have concluded that with very few exceptions, students in these programs progress in reading at least as well as those in comparison groups, and often do considerably better. it is okay to sometimes not read at all. When these ideas are shared with children, the pressure of expectation is removed. So how do we encourage this love of reading freedom in our children? Sharing great books and reading together is always a great place to start, and here are some less traditional types of texts to try. These are a great place to start with boys (and girls!) who are reluctant readers. Following the adventures of Batman, Spiderman and Captain America not only link into popular movies and TV shows, but also assist with engaging children in interesting and exciting texts. Experiences of teachers using graphic novels in the classroom illustrate the value of approaching texts in this way. This refers to any texts that we encounter in our everyday lives, including newspapers, magazines, junk mail, advertising material and even takeaway food menus. In my classrooms I have frequently brought in this material for students to read and it is always surprisingly popular. Some children can pore over a toy catalogue for hours, practising their reading while also developing their pragmatic skills (understanding the ways in which context contributes to meaning). Some of the most engaging texts that children can read are those that they have written themselves. Consider transcribing some of your children’s stories into an e-reader for use at a later time, or encourage your child to publish their own work. Voice to text functions on smartphones and tablets such as those on the Apple iPhone and iPad are also a hassle-free way for your child to create their own texts. You might like to encourage your child to create a holiday diary on your next vacation, as this will make great reading material in the future. By encouraging our children to be adventurous and creative readers, we are establishing reading habits that will stay with them for a lifetime and will assist in their future academic development. 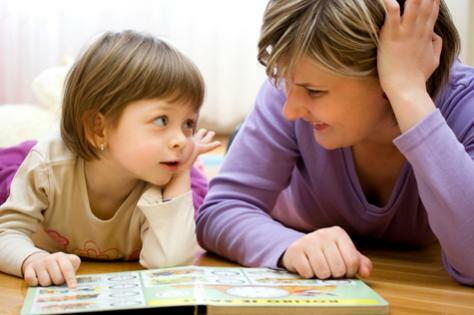 You can change your child's life by reading aloud!